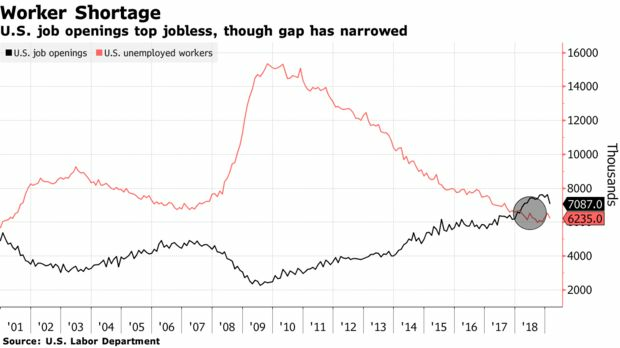 U.S. job openings decreased in February by the most since 2015 while still exceeding the number of unemployed Americans, a sign of some potential relaxation in what’s been a consistently tight labor market. The number of positions waiting to be filled decreased by 538,000 to 7.09 million from an upwardly revised 7.63 million in the prior month, according to the Labor Department’s Job Openings and Labor Turnover Survey, or JOLTS, released Tuesday. The quits rate held at 2.3 percent for a ninth straight month, indicating Americans feel confident in their ability to find new employment. Gee...who was in charge of the House last time ('07) the job openings numbers took a dump??? 1. Gee...who was in charge of the House last time ('07) the job openings numbers took a dump?? ?